I am so sorry for your loss. She was very accomplished at applique and your quilting did it justice. That is a gorgeous piece. I am sure that Betty was rubbing your back and cheering you on as you finished her quilt in her honor. She had a great friend in you. Your feather work looks outstanding, and I truly love the small grid pattern on the outside edge of the quilt. Great job. Thank you for sharing with us. Jeanne, your work is outstanding! What a wonderful tribute to your friend. I am so sorry for your loss. What a beautiful quilt and tribute. You did your friend proud. So very sorry for you loss. 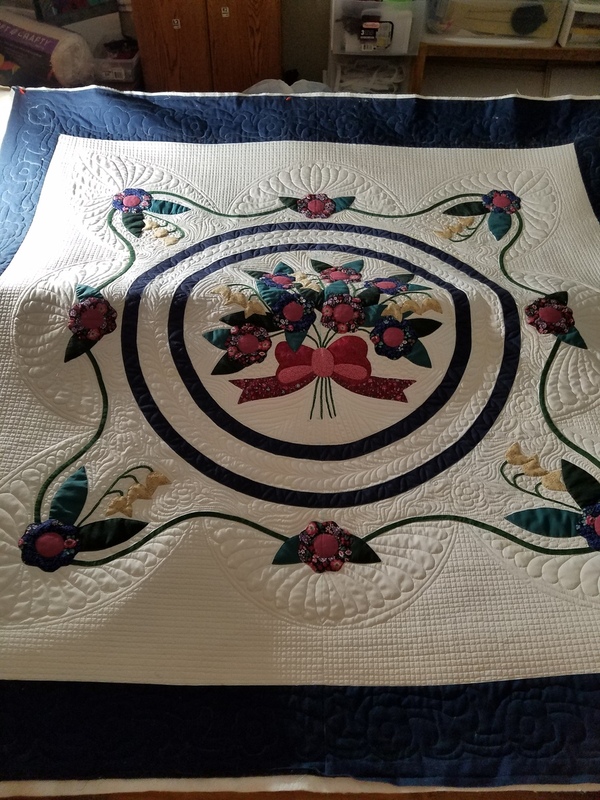 The quilt and quilting is absolutely beautiful. What a great tribute to your friend. A beautiful quilt and meaningful tribute to your friend. Wow, just beautiful. Your friend is smiling in heaven and saying "well done"! Oh My, and Oh My that's beautiful! I love everything but the small crosshatching squares is outstanding! So sorry you lost your friend. You did a beautiful job of finishing her quilt. What a wonderful tribute. How very beautiful, Jeanne! Your friend would be so happy and honored to see it finished! You made a great team. She would be pleased. Beautifully finished. I'm sure you're missing your friend. Her memory will be eternal with her beautiful work around. I love the way you quilted this, especially the designs around the applique in the border and then that tiny tiny crosshatching. Just stunning! Thank you all for the wonderful compliments. It's great to finish up hrr wprk and keeps her close by my side. So Beautiful!! Sorry for your loss! That is absolutely beautiful! I'm sorry for your loss. You have made a gorgeous tribute to your friend. Very beautiful! Both the quilt and your quilting are gorgeous. I know you'll have wonderful warm memories of your friend every time you use this quilt. Great job! Losing a friend is always hard but you have truly honored her with your quilting on this top. Absolutely beautiful. It is beautiful! I had a quilting friend recently die and it is hard not to call and ask her advice. What a very special tribute.